This homemade costume for boys entered our 2018 Halloween Costume Contest. 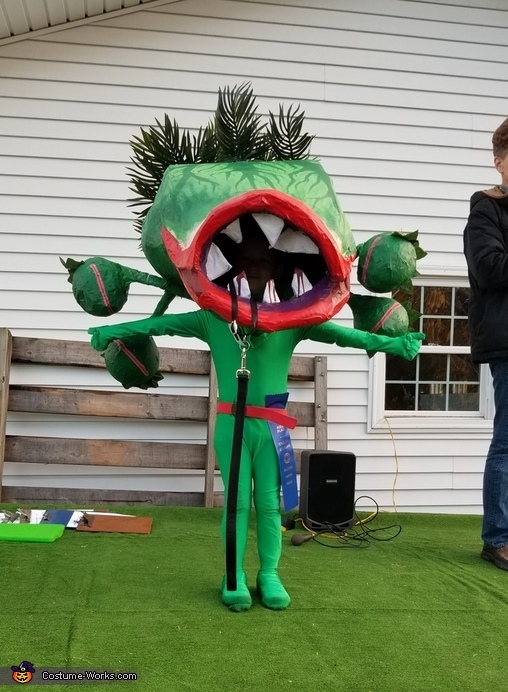 My son Phoenix went as Audrey the venus flytrap from the movie Little Shop of horrors . He chose this costume after he watched the movie. The main head was made from chicken wire I had at the house and paper mache then painted. The small heads were fashioned with balloons that were attached to a sliced pool noodle with a 3/4 inch dowel down the center that would be used for support of the main head and then they were paper mached and painted as well. He wore a green morph suit for the stem that we recycled from a previous year. We then added a dog collar and leash to give the impression that he just ate a dog. We had so much fun working on this together and it was a huge success!